I think I would consider lemon tart to be the most dangerous dessert. Not dangerous in the way of Japanese fugu or anything, I’m not claiming that it will kill you if incorrectly prepared, but dangerous in that capable-of-completely-abolishing-all-willpower sort of way. There’s something about the irresistible mix of buttery pastry, silky custard, and the snap of lemon that seems to prevent you reaching that overload threshold you get with other desserts. Because it has a welcome acidity from lemons, you can just keep on going without feeling yourself slip into a sugar coma. Until you do, of course, slip into a sugar coma, one that has crept up on you like some kind of saccharine ninja and left you defenceless. It just occurred to me that my latest lemon tart experiment, in which I added matcha to the pastry crust, might be a way of combating that. After all, matcha is great for an energy boost, and contains a whole host of antioxidants, minerals and nutrients. It might just help pep you up after the sugar and pastry has done its work. Even if it doesn’t, it gives the pastry for this tart a pleasant light green colour which is beautiful against the lemon custard, and adds a very slight hint of herbal bitterness to the crumbly pastry that complements the lemon perfectly. I made this using some very special Persian sweet lemons that I picked up in the farmer’s market – they have a squat shape, a very bright yellow colouration, quite a few seeds, and a wonderfully vivid taste that has a hint of bergamot. If you can find these, or Meyer lemons, you’re in for a treat, but normal lemons will work well too – just use enough to get the 80ml juice you need for the curd. You could also experiment with the matcha in the crust – Bird & Blend make a fantastic variety, and I think their Black Magic matcha with charcoal would make for a very dramatic-looking dessert! Don’t be discouraged if the curd doesn’t thicken at first – be patient, it can take up to half an hour. Just remember to keep whisking and keep the heat gentle so you don’t end up with scrambled eggs. I like to serve this tart with a scoop of ice cream or crème fraiche, some fresh berries, and a sprig or two of a lemony herb – lemon verbena, lemon balm and lemon thyme all work well. Just be careful. One slice is not enough. First, make the pastry. In an electric mixer, or using a bowl and wooden spoon (this is a good workout! ), cream the butter with the sugar, salt and matcha until light and fluffy. Add the flours and mix well to form a very crumbly dough. 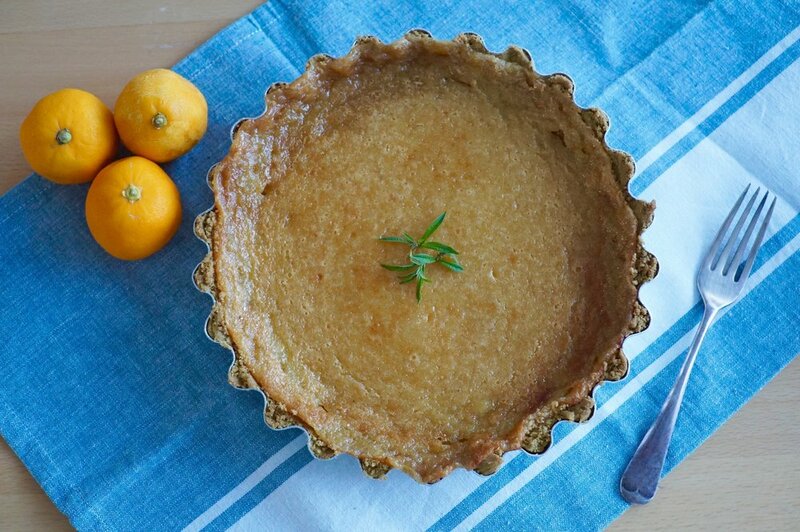 Press it evenly into an 8-inch tart tin with your fingers, working it up the sides and evenly over the base. Meanwhile, put the egg yolks, sugar, lemon zest and juice in a heatproof mixing bowl and whisk to combine. Place the bowl over a pan of gently simmering water, so that the water doesn’t touch the bottom of the bowl. Whisk the lemon and sugar mixture constantly over the simmering water until it starts to thicken – this can take anything from 15 to 30 minutes. It should leave ribbons as you whisk and be very thick. When it has thickened sufficiently, whisk in the cubed butter and remove from the heat. When the pastry case is done remove it from the oven. Pour in the lemon curd and bake for another 10 minutes until just set – it may still be slightly wobbly in the middle, but it will firm up as it cools. Let it cool completely before dusting with icing sugar, decorating with lemon verbena, lemon thyme or lemon balm leaves, and serving with fresh berries and a scoop of crème fraiche.